The Pro Gara jersey has been developed as a garment which can be used under your jacket on extremely cold days or as an autumn/winter jersey. It is particularly warm and comfortable thanks to its slim fit. 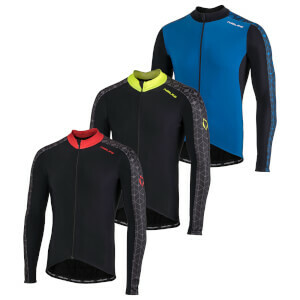 Special attention has been paid to small details of this jersey, like the 3 asymmetrical pockets which allow easy access while riding and the innovative coloured reflective logos. Made by Nalini in Castel d'Ario, Italy. I ordered a medium size, but it seems a little small. The texture and quality of the clothes are satisfactory.